The 2018 Net is the lightest Inglesina stroller, weighing just 11.2 pounds. The base of the seat cover is made entirely of mesh, in order to provide air circulation even in the warmest months. 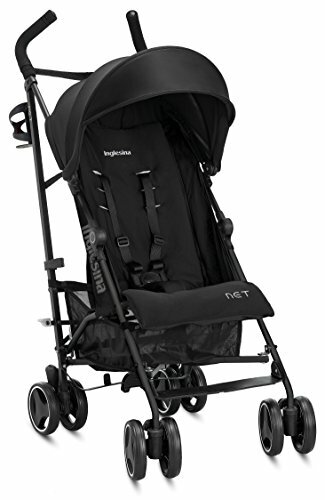 This Net stroller features a frame and mesh that is completely black. The Net's wide seat and 2-position recline allow your little passenger to take pleasant nap, and its canopy is rated UPF 50+(Ultraviolet Protection Factor) to protect him/her from the harmful sun rays. Easy to clean, its seat pad is removable and washable. Net is extremely easy to open and close, and - when folded - it can stand on its own so that no part in direct contact with your baby will touch the ground (plus you will not have to bend either!). It features a practical shoulder strap to take with you on trips. The lightest Inglesina stroller has finally arrived!